Attention all wine club members! 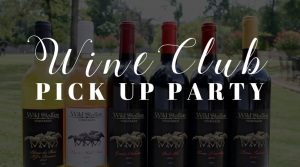 Join us on Saturday, February 16th, from 3:00-5:00pm for our wine club pick up party. It’s the perfect chance to come get your new wine box and enjoy some appetizers and a glass of wine while you’re here! It’s complimentary as a thank you for joining our wine club. If you are unable to attend, please let us know. You can email elyssa@wildstallionvineyards.com or call 281-803-9463 to make other arrangements. If you are not yet a wine club member but would like to be, head to www.wildstallionvineyards.com/wine-club/ for more information. You can sign up online or by calling us at 281-803-9463.